This Snake is sometimes twice as big as the Figure. 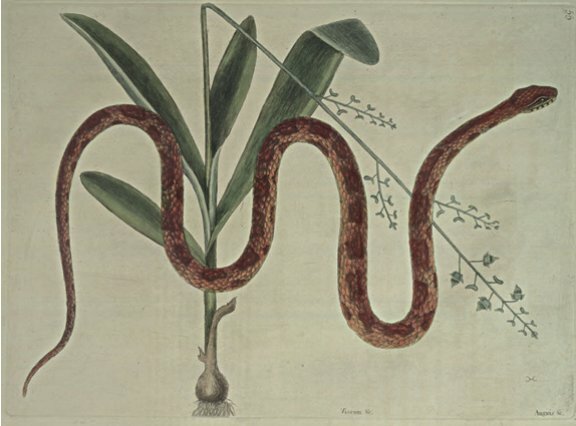 It is all over beautifully marked with red, and white, which seems to have given it the Name of Corn-Snake; there being some Maize or Indian Corn much resembling this in Colour; they are Robbers of Hen-Roosts, otherwise they are harmless. They are common in Virginia and Carolina. This Plant from a bulbous Root riseth with four or five, and sometimes more succulent Leaves; which before it flowers, resemble both in Root and Leaf a Narcissus; from the middle of the Leaves rises a slender stiff Stem, about eighteen Inches long, at the upper Part of which are alternately placed its Flowers, singly on short Footstalks. The Flower is hollow, the Back of the Cup growing into a pointed Petal, and from the Bottom of the Cup on each Side spreads two pointed Petals, the whole Flower of a light Green, within the Hollow of it are yellow Stamina. These Flowers are succeded by small semilunar Seed-Vessels, both Ends being blunt, and one bigger than the other, containing very small dusty Seeds. They grow on bare Rocks on many of the Bahama Islands, and sometimes upon Trees, in the Manner of Misselto.